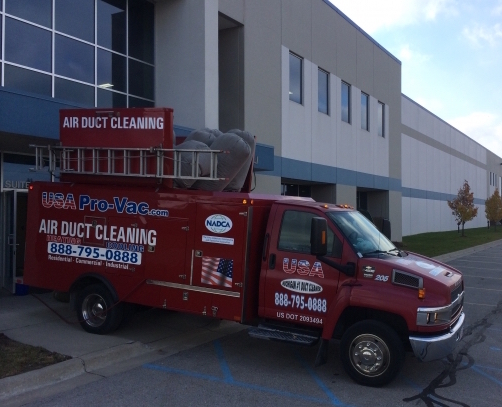 USA Pro-Vac is a family owned and operated business built on a foundation of honesty, integrity, and accountability. Our team fully adheres to the high standards of HVAC cleaning and servicing, as set by NADCA, and will treat our customers and their homes with great respect. We proudly offer the most reliable service in the area; quality workmanship and customer satisfaction are our top priorities, and our EPA/NATE certified technicians are experts at residential, industrial and commercial heating & cooling reparis, as well as indoor air quality services. USA Pro-Vac uses the most advanced state-of-the-art equipment. Our Pro-Vac trucks were built specifically for air duct cleaning by Caddy Vac. It has an unbelievably high suction power with a compressor capacity of 60 gallons that supplies over 300 PSI (pound per square inch). This equipment is approved from NADCA as the most effective air duct cleaning equipment available. For more information about USA Pro-Vac, or to schedule a free estimate for air duct cleaning, humidifier installation, heating and cooling repairs, or dryer vent cleaning, contact us today!